This Chinese Tiger's Eye bracelet is part of a parure set! Age Circa: Art Deco C. Markings: China Silver on the back on one panel, Tested, Guaranteed. Gram Weight: 47.2 Grams. Main Stone: Tiger's Eye. Main Stone Carat Weight/Color: 0.6" long by 0.6" wide, warm iridescent golden brown. The stones appear to be untreated, but we are not certified gemologists and cannot be sure. 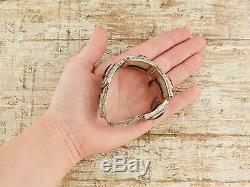 Item Measurements: The bracelet has a wearable length of 7", and is 0.9" wide. Link Type: Hinged Panel Links. 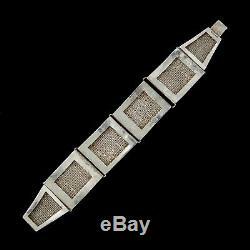 Notable Features: This lovely panel link bracelet was handmade in China during the Art Deco period! The bracelet features four gorgeous hand-cut tiger's eye stones set in raised sterling silver bezels. Each stone is unique, with beautiful bands of warm golden brown and dark brown iridescence, and a bright chatoyancy that plays across the face of the stone. The bracelet is made up of six panel links with an intricate, layered filigree design. The bottom layer is a slightly domed sterling silver mesh panel, atop of which rope twist details, filigree swirls, infinity loops and sterling silver discs have been applied. The four main panels use these ornate details to frame the tiger's eye stones, and add a bright contrast to the warm darkness of the stones. The remaining two panels taper slightly, and are decorated with granulated bead details inside the filigree swirls. The panels are all contoured and connected to one another on hinges, which allows the piece to fit organically to the wearer. The box clasp is cleverly hidden inside one of the tapered panels so the pattern of the links is not disrupted. A stunning piece of work, this filigree panel bracelet would make a wonderful gift. 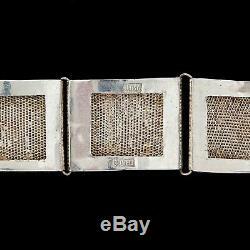 The box clasp has been damaged, and will need to be replaced before this bracelet can be worn. Your local jeweler can easily make this repair. The price has been adjusted to reflect this. This listing is for the item only. This beautiful piece comes from the Art Deco Era! The Art Deco Era is famous for being the "Gatsby" or "Roaring Twenties" Era. A lot of gorgeous and timeless designs in jewelry came out of this period. During the Art Deco Period jewelers often made jewelry upon custom order, this would often take weeks to months to completely craft by hand. Chinese Export jewelry became popular during the late Victorian Period and lasted until the 1960's. In a lot of ways Chinese Export jewelry fashioned what we know of jewelry today. During these periods, Chinese Craftsmen, including Jewelers and Stone cutters, were considered by far the best in the world. The rich and wealthy would have a piece custom ordered through their local jeweler whom was usually gifted at drawing a design to send off to contacts in China to craft and send back. As you can imagine, this was not cheap, that being said, these pieces are very rare and few have survived until today. Chinese Stone cutters were considered some of the finest artisans in the world during the Vintage Era. They would carve western themes as well as the rarer traditional eastern themes into their many pieces. Filigree metal working has been around for thousands of years, however was perfected by the Phoenicians and Etruscan civilizations. It involves stamping out a design in your metal and hand bending and twirling until your design in formed, it is considered one of the most difficult metal working processes. Tiger's Eye is a beautiful stone that is from the quartz family of gemstones. It's famous for its beautiful wavy iridescent appearance throughout the stone. It is called Tiger's Eye due to the appearance of a line of light on the center of the stone that moves when you move the stone, the stone has to be polished to have this however. Chatoyancy comes from the French phrase "il de chat", meaning cat's eye. In gemology, chatoyancy is that particular luminous sheen caused when a band of reflected light moves just below the surface of a cabochon-cut gemstone. Chrysoberyl and Tigers Eye are the stones best known to exhibit this phenomenon. Please take this into consideration before. 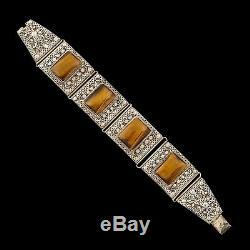 The item "Antique Vintage Deco Sterling Silver Chinese Tigers Eye Filigree Link Bracelet" is in sale since Sunday, December 31, 2017. 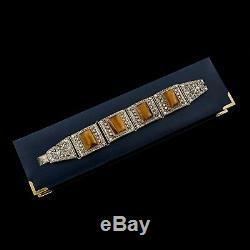 This item is in the category "Jewelry & Watches\Vintage & Antique Jewelry\Fine\Art Nouveau/Art Deco 1895-1935\Bracelets". The seller is "abeautifultimeco" and is located in Fort Collins, Colorado. This item can be shipped worldwide.